The day many have been waiting for eagerly has finally arrived - Nokia has just announced its first Android flagship smartphone. The Nokia 8 has been a long time coming. Nokia fans have waited years for their much-loved company to embrace Android. And the smartphone does not disappoint. 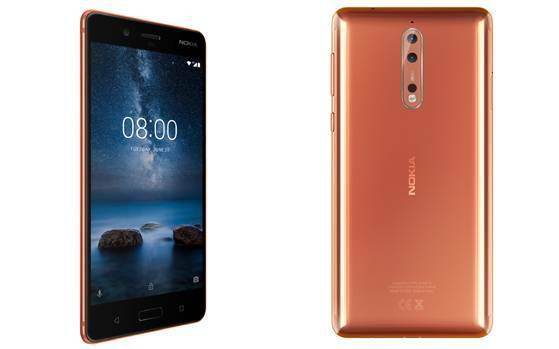 The Nokia 8 is carved out of a single block of aluminum and comes with ZEISS powered dual cameras, pure Android, top of the line specifications, OZO audio and much more. Although happy at the return of their beloved brand, ardent Nokia fans were a bit disappointed back in February when HMD Global announced the Nokia 3, 5 and 6 at MWC 2017. Although capable smartphones, they were no match for the iPhones and Galaxy S8's of the world. The Nokia 8 is one of the most anticipated smartphones of the year and rightly so - it is not only the first high-end Android smartphone from Nokia, but also the first flagship from the company's stable since the dark Windows Phone days. The Nokia 8 is constructed entirely out of metal and carries forward the design language seen on the Nokia 3, 5 and 6. The smartphone looks modern yet pleasantly reminiscent of Lumia smartphones of old. The Nokia 8 is machined out of a single block of series 6000 aluminium and is just 4.6mm thin at the edge and 7.3mm thin on average. Nokia claims that the smartphone is put through a 40-stage process of machining, anodizing and polishing and that the high-gloss finish on a few color variants takes over 20 hours to complete. The rear is dominated by the vertical dual camera setup below which sits the Nokia branding. On the front, there is a physical home button flanked by capacitive keys for back and recent applications. There is also a fingerprint sensor embedded into the home button. In a slightly disappointing move, the Nokia 8 does not come with an edge-to-edge display or a bezel-less design as seen in recent flagships such as the LG G6 and Samsung Galaxy S8. The Nokia 8 is powered by Qualcomm's latest high end chipset - the Snapdragon 835. The 10nm processor is found in most flagships of 2017 such as the HTC U11, OnePlus 5, Samsung Galaxy S8 and Xperia XZ Premium and is arguably one of the most powerful processors in the market currently. Additionally, the Nokia 8 comes with 4GB of RAM, the Adreno 540 GPU and 64GB of internal storage which can be expanded via a microSD card (of up to 256 GB). The Nokia 8 comes with a 3090 mAh battery with Quick Charge 3.0 support. 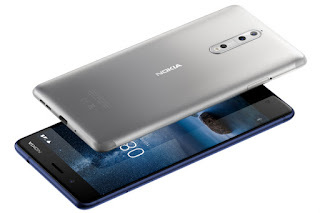 Nokia claims that the Nokia 8 comes with a very innovative heat management solution with a full-length graphite shielded copper cooling pipe that dissipates heat across the full length and breadth of the smartphone. The Nokia 8 comes with a 5.3-inch Quad HD IPS LCD display with a resolution of 2560 x 1440 and 2.5D Gorilla Glass 5 on top for protection against nicks and scratches. The display is particularly bright with 700Nits of maximum brightness and comes with Nokia's trademark Glance Screen. Just like the Nokia 6, 5 and 3, the Nokia 8 runs on a 100 percent stock build of Android and comes with the promise of timely monthly security updates and yearly Android version updates. The Nokia 8 runs on the latest version of Android - 7.1.1 Nougat with no unnecessary bloat and changes. Nokia has promised that the Nokia 8 will be updated to Android O as and when it is released. Nokia claims that they will be the first or amongst the first non Google manufacturers to release Android O to their smartphones. The marketing for the Nokia Android smartphone line-up reads - 'Pure, secure and up-to-date'. Nokia has had a long and storied history when it comes to smartphone photography. Along with Carl Zeiss, the company has given us iconic camera phones such as the Nokia N95 - the first phone in the world to come with a 5MP rear camera and the Nokia 808 PureView - which came with a 41MP rear camera. Nokia 8 carries forward the legendary Nokia - ZEISS partnership. The Nokia 8 comes with a ZEISS powered dual camera setup at the rear - a primary 13MP RGB (color) sensor with optical image stabilisation paired with a 13MP secondary monochrome (black and white) sensor. Both cameras have an aperture of f/2.0 and the setup comes with phase detection auto-focus and a dual-tone flash. The rear camera(s) can also record video in 4K resolution. Nokia claims that the secondary monochrome sensor allows for the capture of depth information and helps improve low-light photography by capturing more data. On the front, there is a 13MP sensor with an aperture of f/2.0, display flash and phase detection autofocus which has also been developed in association with ZEISS optics. On the connectivity front, the Nokia 8 supports 4G LTE, Wi-Fi 802.11 a/b/g/n/ac with MIMO, GPS/AGPS, GLONASS, NFC, ANT+ and Bluetooth 5.0. Unlike many flagships of late, the Nokia 8 comes with a 3.5mm headphone jack which should please audio enthusiasts. Additionally, it has a USB 3.1 Type-C port for charging and data transfer. The Nokia 8 is the first smartphone in the world which allows 'Dual-Sight' video to be live streamed natively and in real-time to social feeds such as YouTube and Facebook. Dual-Sight allows you to use the front and rear camera at the same time in a split screen view. This feature can be utilised for both photos and videos. Nokia 8 users can backup unlimited photos and videos to Google Photos. Nokia is promising a 360 degree fully immersive audio experience with the Nokia 8. The smartphone's three microphones and Nokia's acoustic algorithms allow you to capture 360 degree spatial surround sound. You can also share 4K videos with OZO audio with anyone - binaural codecs ensure high fidelity playback even on devices without OZO Audio. While the Nokia 8 does not come with IP68 dust and water resistance, it is splash proof (IP54) and will be able to withstand light rains and splashes of water. The Nokia 8 will go on sale globally in early September for 599 Euros, which roughly translates to around Rs 45,500. While there is no official word on the Indian launch, the smartphone is set to arrive in the country sometime in the month of September itself. The Nokia 8 is expected to be priced at Rs 39,999 in India to compete with the likes of the OnePlus 5. The smartphone is available in four colours variants, namely Polished Blue, Polished Copper, Tempered Blue and Steel.